Our company is engaged in water purification in the industrial, living and any other conditions. 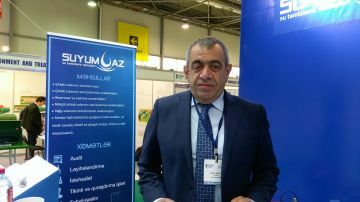 We have twenty years of experience in the Azerbaijani market. The technologies that we are showcasing are free from chemicals; moreover, the discharge during cleaning is minimal. A conventional filter discharges 20% of water, while this indicator equals to 1% with our equipment, which has a positive effect on energy and water saving. We have so far implemented a number of projects. We work closely with Azersu, and implemented a number of government projects as well. To date, we are working on water treatment in the city of Aghstafa and in Bilasuvar. In addition, we cooperate with perfumery factories and plants for the processing of poultry meat. We work in Georgia and a few projects are being developed in Uzbekistan. We are official representatives of foreign companies. One of them is wastewater treatment company Biotal. Today at the exhibition we are demonstrating an innovative technology for disinfecting water at the DNA level of the Israeli company Atlantium. In addition, we are showcasing the innovative solution “MineralPure” for water purification in swimming pools and “ScaleBlaster” which is designed to eliminate scales. We try to participate in this exhibition every year, because it is important in terms of the company's image and getting a strong foothold in the market. I like the organisation of this event. In my opinion, a lot depends on the visitors; the more business-minded people among the visitors, the better for all of us.